Bi-Xenon HID+LED Passing lights Combo Kit for Harley SoCalMotoGear.com - Professional Grade Motorcycle Lighting - Plug N Play Products - "Riding at night has never been brighter!" Seriously improve your lighting Day or Night. Custom designed and Road Tested on Harley Motorcycles. This complete kit replaces your Headlight to HID and replaces your dull yellow passing lights to Bright White LEDs! Unlike other kits, you do not need to run bulky wiring back to your battery! This professional Bi-Xenon HID + LED Passing lights Combo Kit will completely replace your factory Harley headlight and passing lights to our HID headlights & LED passing lights. This kit will enable you to have HID's for your LO and HI beams and high powered LEDs for your passing lights that will closely match your HID light. There is no other combo kit on the market like it. 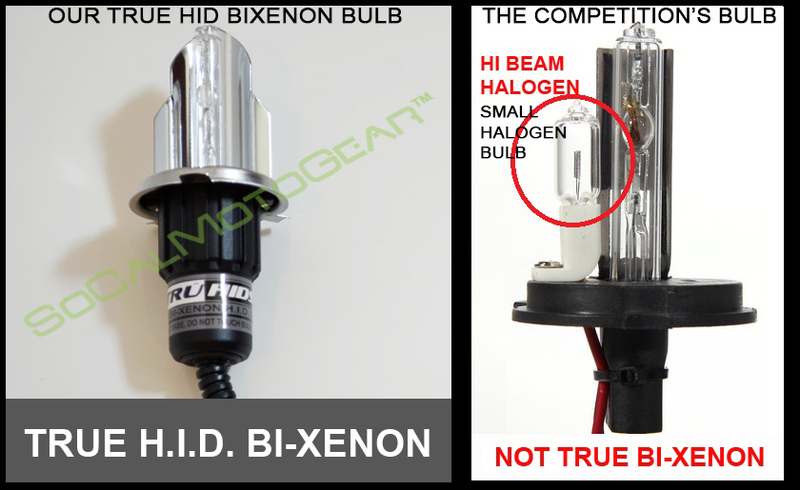 Unlike cheap kits that uses a small halogen bulb for the high beams, our kit is a true Bi-Xenon HID kit. This means the bulb will toggle up and down to give you the HID high beam pattern when engaged. This kit includes our 50W LED passing lights.This is one of the most popular Lighting packages that we offer and will convert your headlight to HID and passing lights to LEDs. Choose the Standard 50W LED bulbs for your passing lights if your motorcycle is 2006 or up. If you have an 05 or older model, you possibly have either have an H3 bulb or sealed beams in your passing lights. You will need to confirm which one you have. Only choose the 50W H3 LED bulbs during checkout if you know that is the bulb you need, otherwise checkout with the standard option. 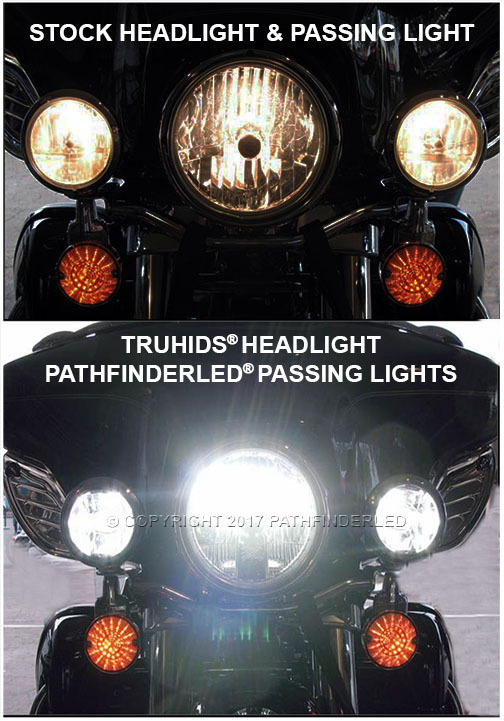 If you are looking for a sealed beam replacement, we have the (HDPL45) PATHFINDERLED Passing Lamps that are plug n play. If you are unsure, you can also take a close up picture of your passing lamps and email it to us and we’ll be happy to advise or you can check our passing lights product page below for more details. NOTE: * This kit will fit any Harley motorcycle that does not use a sealed beam. As long as the bulbs are replaceable, this H.I.D. kit should work. Also, please make sure there is space to mount the ballast which usually there is ample space in back of the headlight bucket. Most 7inch headlamp motorcycles will have no problem. With After Market parts, slight modifications may be necessary on some bikes. 2006+ models do not need any adapters to work with our twist on LED passing lights. FITMENT : Non-Sealed Beam Road Kings, Soft tails, Electra Glides, Street Glides, and suitable for application in fairing/nacelle housings. Heat: These bulbs DO NOT run hot compared to your standard stock halogen bulbs, they run much cooler. Considering an LED HeadLamp? Our NEW 7 INCH PATHFINDERLED HEADLAMP will replace your main headlight to LED and outputs a better light than the Daymaker. Projects a further and wider beam resulting in better coverage and visibility. Customers have reported side visibility is terrible on there setup until they upgraded to our LED passing lights. Our lights can keep your original factory look and maintain that tradition. A Bi-Xenon H.I.D. Bulb (6000k = diamond white). A professional TruHids® Bi-Xenon direct connect cable. We use 25W Digital Micro Ballasts as there is virtually no difference from the 35w except these ballasts uses a lesser amp draw. How to Determine if you have Replaceable bulbs in your passing lights or Sealed Beams. 500Lumens Cree Hi Powered LED Chip - 12v - Less than 1amp draw per LED bulb. The only true Plug N Play kit that makes installation a snap! Only our kit lets you easily revert back to your stock lighting should you wish to. Easy install - Install it yourself. Takes less than one hour to install. solenoid that controls the light up and down giving you a true H.I.D. Average Customer Review: 5 of 5 Total Reviews: 91 Write a review. So much brighter than factory lights!! Glad I made the purchase. The service and delivery was excellent! Had a little hiccup, contacted SOCAL, exchanged a few emails, determined the problem to be the ballast, received a new one very quickly & Bingo--bright lights! Remember, any electrical equipment can leave the manufacturer and be defective...be nice, be patient and you'll get your product....and always--- Thank You!! Very pleased with my purchase. Lights were an easy installation. I wish I knew about these lights a long time ago. These lights will be my first aftermarket purchase on any new bikes I buy from here on out. I wasn't a fan of the other lights I seen on the market. They looked like an ugly 3 eyed alien and twice the price and 3 times the install. 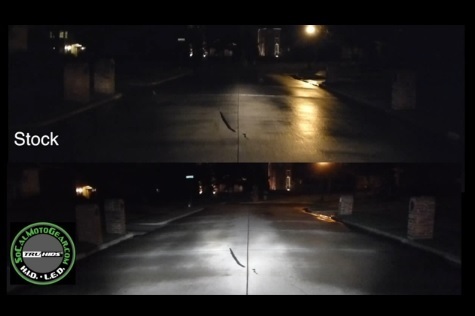 Cost, look and most incredible difference on actually being able to see at night. Let alone the clear white glow, how could you go wrong with these lights. Even the install was as easy as in the video. I know it didn't take more then a few minutes. Thanks SoCal for the extremely awesome upgrade! I'm one happy customer!!! !